It's been a while since we last chronicled the adventures of Kim Dotcom and the results of the MegaUpload takedown. We've been impressed, though, by the persistence and persuasiveness of Dotcom. Now, he's back with a new service that takes on Dropbox, Google Drive, iCloud and other cloud-based file storage systems. As reported by Ars Technica, the site is designed to be simple to use and offers 50GB of free storage. Paying users get 500GB of storage plus 2TB of transfers for $14/mo. All files are encrypted so the only way to share a file is to generate a public link to the file. Given that users are moving more data between devices, 50 GB seems like a lot but might soon become standard amongst rivals. One tidbit bears watching: Users who share links to files with other Mega users see those files appear immediately in the users' account, similar to Google Drive. At Bitmenu, we have experimented with for-pay distribution using cloud-based systems. In other words, users of Mega might one day put a price on the files they share (currently, Bitmenu sellers must upload their files to our servers). Would you want that? 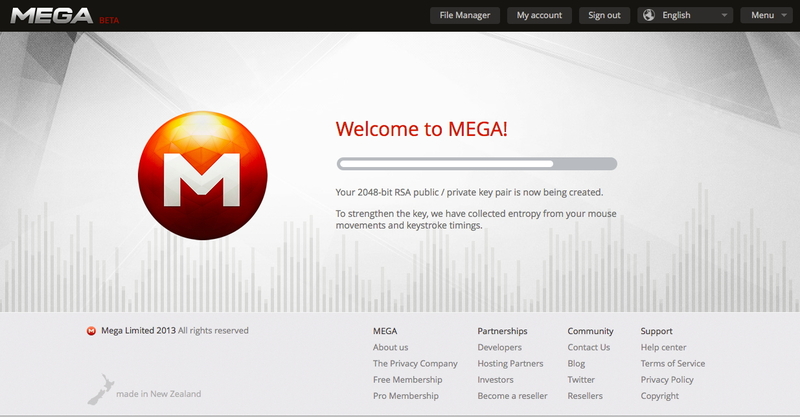 Update: In some respects, the federal takedown of MegaUpload has enabled Kim.com to pivot and release a version 2.0. How is it different? As detailed in Forbes, only the individual user holds both the encryption and decryption keys to the files they load into the system. This means that Mega cannot ever know what is being stored on their service and thus cannot "turn over" that content to authorities if required to under warrant.